The documented history of the Simmons School building is sketchy, but a great deal is known about the social history of the one room school era in Bartholomew County and Hawcreek township. 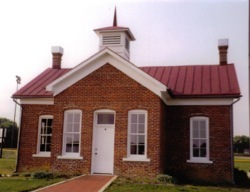 From county records it was determined that the original site of Simmons School, located 4 miles northwest of Hope, was deeded to the county as a school section in 1837 by John and Nancy Drake. The first structure built on this section was a log school. It was replaced by a brick structure that was later remodeled by adding an entrance room and bell tower. An architectural survey of Bartholomew County done in 1979 related that the Simmons School was built around 1879. The school was used until 1907 when all the students of the township were sent to Hawcreek Central School. After it's closing, the building was used for a variety of purposes. Fred Simmons, whose family owned the land for a while, remembers the family’s home burning and the family had to move into Simmons School. He related that other families also lived for brief periods in the schoolhouse. The building was later used for farm purposes. It was the site for cleaning tomatoes being prepared for market and the canning factory in Hope. It served as a storage shed for tools and even for grain storage. When the Hauser Historians were asked to investigate the existing one room schools of the area to help select the one to relocate to the educational complex, they fell in love with the badly deteriorating Simmons School. All the windows had been broken. Chalkboards were gone, as was most of the plaster and woodwork. The floor had caved in, and there were cracks in the back wall large enough for a person to stick his arm through to the outside. The bell tower was intact, but the bell was missing. 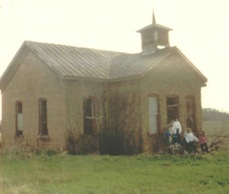 Once restoration was underway, the Simmons Family donated the original bell to the schoolhouse where it proudly rings to welcome each group that visits.